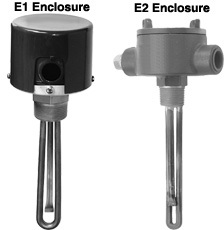 Enclosures: E1 general purpose, NEMA 1 (IP00) rated, or type E2 moistureresistant/ explosion-resistant enclosure2. * Designate voltage, i.e., "120" for 120 Vac or "240" for 240 Vac. Heaters with general purpose enclosures are UL Listed and CSA certified. Heaters with moisture-resistant/explosion-resistant enclosures are CSA NRTL/C certified and are not intended for use in hazardous areas.